Who knew we would actually like a buffet? Well, the buffet teppanyaki lunch in Shima isn’t the typical mass-cook-self-serve type of buffet I guess. Your portion is individually cooked by the chef on the teppanyaki counter for you, and it is eventually served by the waitstaff. The good news is everything’s still free flow. So if you like something, you may ask for a second/third/fourth helping, if you can stomach the already substantial portions that is. 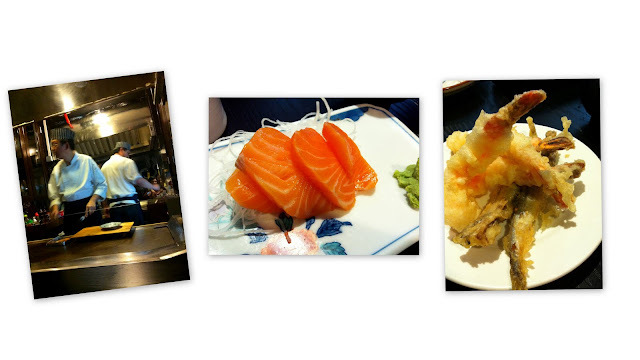 For appetizers, you get thick slices of salmon sashimi, and a tempura of prawns and shishamo. Tell the waitstaff if you want some california handrolls because those are not automatically given. 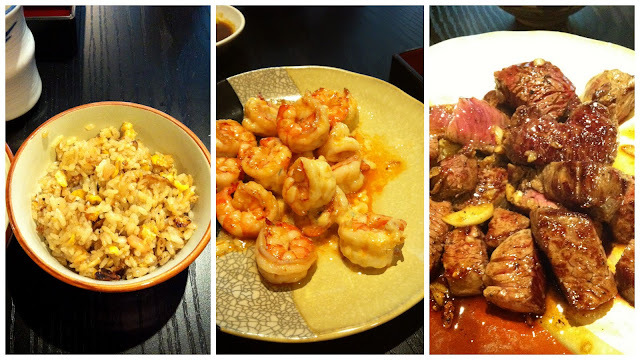 Moving on to the mains, a choice of steamed/garlic fried rice, prawns teppanyaki-ed in mayo, and beef with a choice of doneness. This is just ordinary beef cooked exceptionally well. We requested for medium, and it came as such. I think it was smart of the chef to vary the flavours of the teppanyaki dishes. Instead of adding only salt and pepper to everything, each dish was done a little differently to differentiate it from the rest. 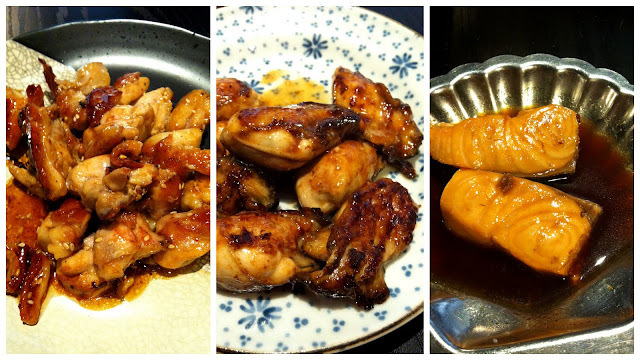 The chicken was given a generous shower of white sesame seeds and a light caramelization from the teriyaki sauce. The plump oysters were my favourite of the day. The chef treated them really carefully during the preparation so that they would retain their natural umami flavours. Another favourite, were the salmon slices poached in some sort of sweet shoyu. Poaching salmon is a method of preparation that I like because it keeps the flesh moist and still maintains the flavour of the fish. We ended the meal with watermelon slices and tea. The bill totaled to $140 for 3, $46.70 ea (including GST, service charge). That’s quite value-for-money considering everything’s free flow as well. The premises isn’t the swanky hotel standard that you would expect from Goodwood park Hotel, but it’s still decent nonetheless. Note: oysters are seasonal items. We ate this meal on a Sunday.